Yes. 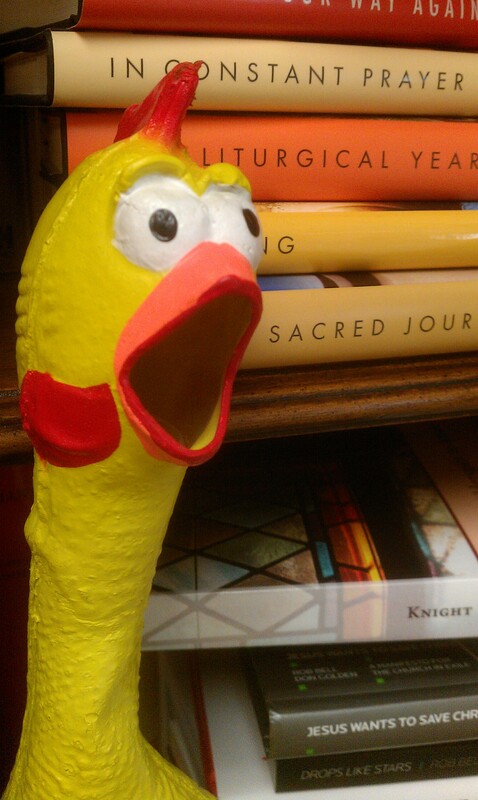 This is my rubber chicken. I didn’t grow up going to church. The few times I remember going were for weddings, funerals and an occasional Sunday School class with a cousin. I had heard of God and Jesus, they just weren’t part of my everyday-walking-around-living-life thoughts. So when a young girl I was interested in invited me to spend a week on a youth mission trip, I jumped at the chance. Not to spend a week serving. Not to learn more about God/Jesus/the Church. To spend a week with a young girl. Long story a bit shorter, she didn’t go. I did. A couple dozen nudges and lots of conversation later, I became a pastor. I’ve written papers about my “call to ministry”. I’ve read the call stories in the Bible and nodded along as I compared my own sense of call with some of the biggest names in the scriptures. Moses. Isaiah. Jeremiah. The Disciples. For me, being a pastor is a great honor and an amazing journey. I have been with people as they breathed their last. I have held hands with people who just received news there was nothing more that could be done. I have laughed with new parents. I have stood in the lake and baptized new brothers/sisters in Christ. I have prayed and preached and sometimes I have even seen God use the things I have said to impact a life. I like what I do. I love that I get to do it. So, when my son told me the other day that I needed to “get a real job”. I wasn’t really sure what to say. When he added “like a DJ”. I probably laughed. My son, the future comedian. But I’ve been thinking about that micro conversation. What I see as a humbling gift from God – the opportunity to be a pastor – does my son sees as a waste of time? What have I done or not done to leave him with this impression? What have I said, not said that led him to believe this is anything short of the best occupation ever? And I think that must be the answer. In his eyes, being a pastor is an occupation. A job. It looks like a lot of writing and reading and talking. It doesn’t look like an adventure (but it is!). It doesn’t look all that fun (it certainly can be!). It doesn’t look like anything he’d ever imagine wanting to do himself (of course, neither did I!). I’m interested in what he might say if we had a conversation about how I see what I do. Not as a job, but as a vocation…as a calling. As something I do, because I have been uniquely gifted to do it. As something I do, because I couldn’t find fulfillment and satisfaction doing anything else. At the end of our conversation he might still think it’s better to be a DJ than it is to be a pastor, but I pray he’ll understand, for me it could never be.